There is a reasonable gay community present within the city of Cleveland, with a number of bars and clubs providing places to hang out in the afternoons and evenings. While some are geared towards an LGBT clientele, most target a mixed crowd of punters. The whole LGBT scene in Cleveland has certainly been elevated in recent years, thanks to the city and neighboring Akron hosting the prestigious Gay Games in August 2014. This major international sporting event is staged in different cities around the world every four years. 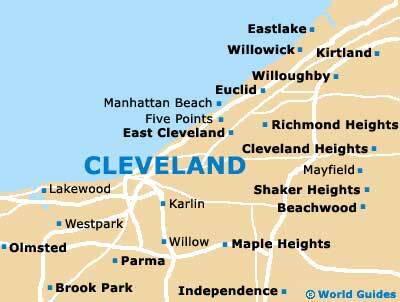 There is a noticeable gay presence within the Edgewater neighborhood, which resides on the southwestern side of Cleveland, around the lakeside Edgewater Park. Here you will find a number of bars lining the prominent thoroughfare of Detroit Avenue (Highway US-6), with some of the most popular spots including Cocktails Cleveland and Now That's Class, where weekly specials include Thursday Bike Night and Sunday Happy Hour. Also located on Detroit Avenue is Bounce, a lively bar with good food, live music, dancers, amateur drag nights and cabaret acts, all of which draw in a very diverse crowd. Elsewhere in Cleveland, some popular gay bars can be found within the Historic Warehouse District, standing on East 26th Street and West 9th Street, the latter of which is where you will find the rather chic Anatomy Nightclub and Ultra Lounge. First held towards the end of the 1980s, Cleveland Pride has never been more popular and is now one of Ohio's largest and most successful LGBT themed celebrations, drawing in the region of 25,000 attendees. Attracting a number of headline acts, including both singers and stand-up comedians, the pride festivities take place every year on a Saturday towards the end of June. 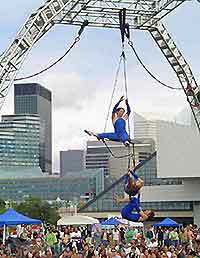 Many of the principal events are staged at the Voinovich Bicentennial Park, which is located right next to Lake Erie and just beyond the Rock and Roll Hall of Fame. The Pride Parade itself is the big crowd pleaser, beginning on West 3rd Street and heading along Lakeside Avenue East, before joining East 9th Street and finally reaching the Voinovich Bicentennial Park. In total, the procession comprises more than 3,000 people and around 40 individual carnival-style floats.